Office Hours: 7:30a.m. to 3:30p.m. Head Start is a Federal program for preschool children from low-income families. 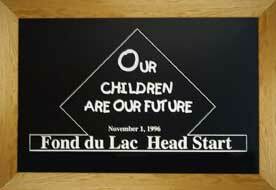 The Fond du Lac Head Start program is part of the American Indian Alaska Native Programs Branch of Head Start and gives preference to children of American Indian descent. Head Start offers children and families a variety of components to help meet both the family and child's needs. Families are encouraged to be involved in a variety of ways throughout the Head Start program. Center-based classrooms offering an Emergent Curriculum that focuses on family, child, community, environment, and teacher interests and needs. Ongoing child observations and developmental progression. Developmental screenings using the DIAL-3. Parent Committee meetings monthly to assist with curriculum planning. Education Committee that meets at least annually to develop the curriculum. Family Conferences with the teacher two times per year. Home Visits with the teacher two times per year. Volunteering opportunities on a regular basis or even just one time. Paid substitute-teaching opportunities (must pass a background check, be at least 18 years of age, and hold a high school diploma or GED). Opportunities to serve on the Policy Council, which meets once per month and oversees program functions. Opportunities to serve on the Transition Committee which determines activities to ease transitions into and out of Head Start programs. Educational Opportunities through Even Start, Early Childhood Family Education and Head Start trainings. Family Partnerships developed with your family's Family Service Program Manager. Community Resource Guide available for locating resources in the community. Lending Library of books, games, toys, and computers available for use while at Head Start. Home Visits with your family's Family Service Program Manager. Families who have a child with a disability are encouraged to apply and are given priority for enrollment. All children entering Head Start must complete a developmental screening. If necessary, further testing is done to determine if the child qualifies for special education services. Children receive services in the classroom environment with their peers. When necessary, specialized services may be provided outside of the classroom for one-on-one assistance. A Disabilities Service Plan is created annually outlining disabilities services. Families of children with disabilities are invited to participate in creating this plan.